He jokes about trying to avoid school from since he was in preschool. “Kindergarten didn’t work out,” he jokes. “I was quite a handful back then.” If that was indeed the case, then a lot has changed since the early 1990s for the young Ilyayambwa who, at only 30 years of age, has just been promoted to associate professor. He picked up many good qualities from them such as a strong work ethic, discipline and commitment which he believes contributed to the person he is today: “People see this promotion as my achievement, but I look back at my life and see the part that so many people had to play so that I could become the individual that I am today: my parents more than anyone else.” That is why he made it a priority to go “home” after he got the news of his promotion. He completed his primary and secondary school education in Botswana. When it came to his tertiary studies, he headed to the NWU’s campus in Mahikeng as an international student where he enrolled for a bachelor’s degree. Here he soon played an active role in the student leadership sphere. Starting out as an additional member of the Law Student Council, he soon moved through the ranks as legal officer on the former Campus Student Representative Council and finally as chairperson. “All those phases in my life came with challenges and lessons of their own. I had to make many unpopular decisions,” he remembers, and adds that this is something that he still has to face today. “You can’t make everyone happy. 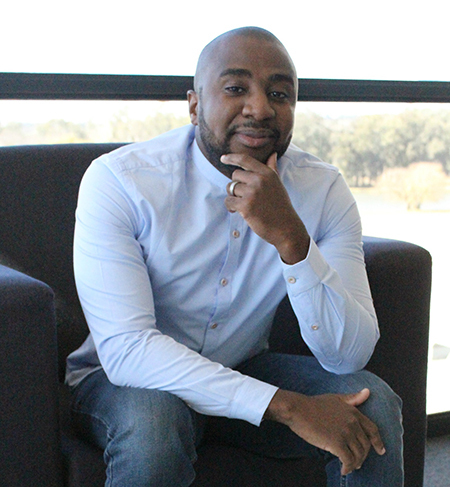 You need to rely on your team and when the decision is made, swiftly continue to implement it.” The completion of his bachelor’s and eventually master’s and PhD degrees in Mahikeng was only the start of his journey at the NWU. Prof M, as he is affectionately known on the NWU’s campus in Vanderbijlpark where he currently works as a senior lecturer, remains absorbed in his academic research interests. His specialist area is law, specifically regional integration law. He explains that regional integration law has to do with, among others, the Southern African Development Community (SADC) and its cooperation with member states of the African Union and how to steer economic growth – from a legal perspective. On a personal level, Ilyayambwa learns a lot from his students. He jokes about the patience that he needed to develop to filter through the interesting stories that students tell to obtain more marks. “Not so long ago, I was a student too. I find their energy contagious.” Some of the stories however, turn out to be true, and therefore he needed to develop the necessary compassion to work with students from challenging backgrounds. His sights are firmly set on a full professorship for which one’s research outputs, supervision and production of postgraduate degrees, as well as supporting the governance processes of the university, are some of the main considerations – all areas in which Ilyayambwa has already been making a considerable contribution at the NWU. He is married to Busi and the couple has a baby daughter, Nalishebo.